Quick! Make friends with people who work at BlackBerry! Why? Because a limited number of BBM for Android invites have gone out to internal staff as well as some of their closest companions. 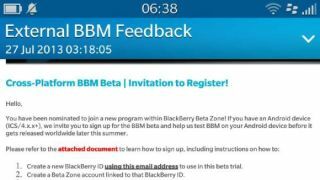 "The BBM beta for Android users is a very limited program," said the company to TechRadar regarding its forthcoming messaging app. "That includes BlackBerry employees and some invited friends and family." The fact that BBM for Android is being tested right now is good news for BB10 users who want to communicate outside of their BlackBerry bubble. It's a sign that the wait is almost over. While BlackBerry didn't respond to TechRadar's question about the exact BBM release date for Android and iOS, the company has previously promised to deliver this summer. In fact, the Canadian smartphone manufacturer reiterated that promise for Android this month. "The service is coming to Android this summer. But summer as per North America, where it remains till September." Judging from your definition of summer in North America, that's either on month from now during Labor Day or, more technically, the Autumnal Equinox on Sept. 22. Either way, BlackBerry for Android and iOS should arrive in the Google Play store and Apple's App Store just as the leaves start falling. Read why BBM for rival platforms could be a bad idea.